Our buddy and Lush teamrider Josh Monk went on a trip to Lanzarote with his Chopper 3D for a bit of freeriding recently… words by Josh, Photos by Pablo Paxi. I’m a regular to Lanzarote; it’s landscape, coast, art, culture, people, food, hidden treasures and of course skate spots make me return again and again. It has gained a slightly negative reputation as a ‘Brits aboard’ tourist destination, but this is only because of some concentrated all inclusive hotels and resorts that are in a few pockets along the coast. It’s very easy and cheap to rent a car and get away from this to see the real island, which is fantastic. I skated my first proper hill in Lanzarote about 6 years ago with my first Longboard set up and was hooked. Many of the roads have super smooth tarmac which contrast nicely with the jagged volcanic rock/solidified lava which make up a lot of the island. Try not to crash into it though, as its not like hitting a grass verge! Josh skates a Chopper 3D for pretty much everything.. it’s a true all-terrain vehicle! 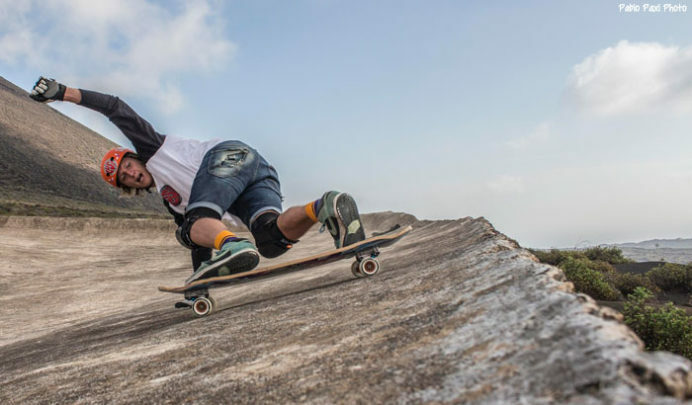 Although not as geared up and we’ll known for downhill as its fellow Canary island Tenerife, there is still a great variety of spots to skate, as my local guide, friend and co-founder of ‘Longboard Famara‘ Pablo Paxi showed me…. From a mountain/volcano switchback descent, to a steep winding road below a castle that is completely closed to traffic after hours, to a fun, long run through a lava field down towards the coast. The icing on the cake being a massive redundant storm drain on the side of a volcano, which was used to collect drinking water in the winter. It is steep, long and wide, and follows the undulating contours of the volcano, it’s a great feeling, a totally new way of skating…somewhere between a snowboard piste, bowl and a concrete wave. It is also one of the highest points on the island with panoramic views. 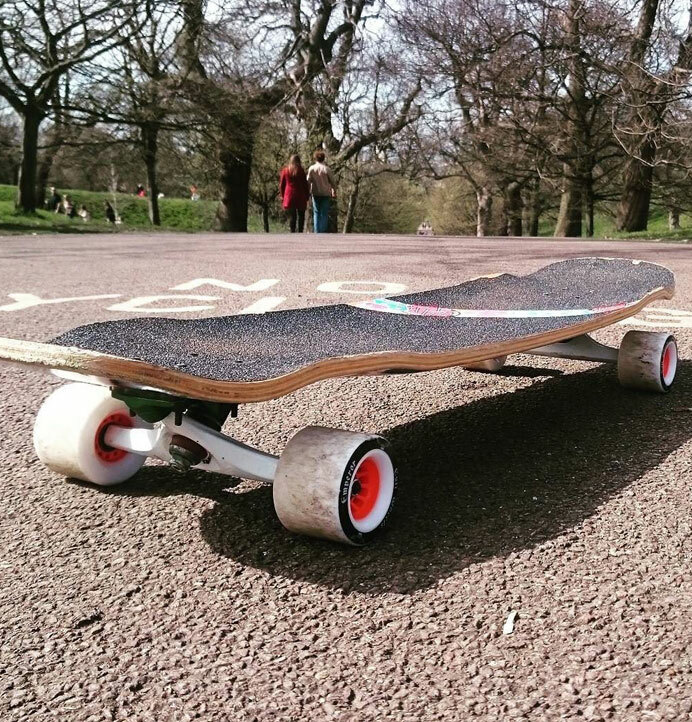 If cruising, dancing, freestyle or even street skating are more your thing then there are plenty of beautiful spots for that too…and the constant sunshine and warm weather mean you won’t be disappointed, along with the fact that a lot of the time it feels like you are skating on the surface of Mars!